Saturday, 11:47 a.m. — The coma lifts and I find I am still wearing the same clothing from the night before. My body will look to remind me over the next few hours that there is a limit to the number of adult beverages I should consume in a single night. 1:14 p.m. — Finished shaking off the remaining rust from the previous evening, we set out on the Ring Road once more, this time heading northwest rather than south. Before we truly get going, however, another gas station breakfast (brunch?) is in order. There’s nothing quite like waiting until the last minute to plan something out. And it doesn’t get much more last minute than when you’re sitting at the kitchen table in your Airbnb after a long night of shenanigans in the northernmost capital city in the world searching up places to be and things to see on the Google Machine less than an hour before you’re planning to hit the road. 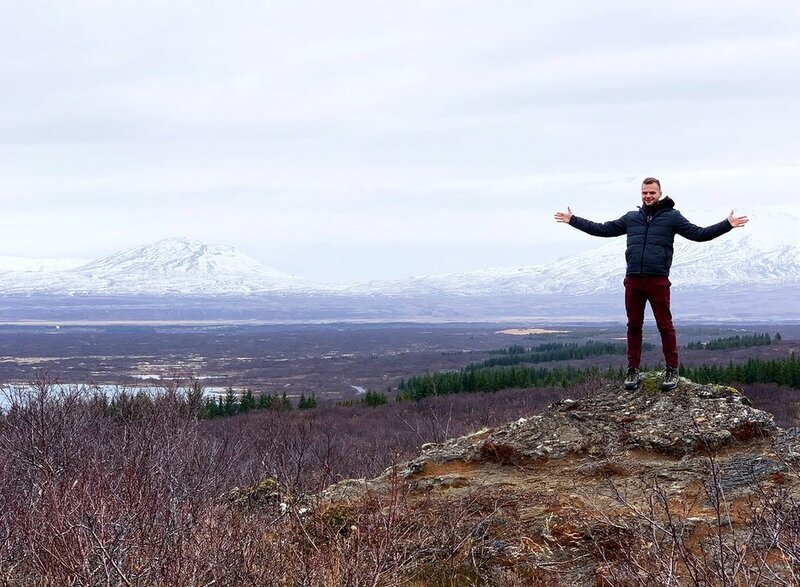 After visiting the western half of Iceland’s southern coast on Day 2, I knew we’d be looking at doing the upper half of the Golden Circle tour on Saturday, I just didn’t know which specific stops we’d be making. For those unfamiliar with the Golden Circle, allow me to learn you something real quick: covering about 190 miles, Iceland’s Golden Circle is a well-traveled tourist route that connects Reykjavík, the capital, to a handful of some of the country’s most popular sights. Among them are: the Geysir hot spring area, featuring one geyser that spouts water every few minutes; Gullfoss, a cascading waterfall located in the canyon of the Hvítá River; and Kerið, a volcanic crater lake which formed some 3,000 years ago. You can see all three of those places and perhaps others by signing up for a bus tour of the Golden Circle — which we considered at one point — or you can take matters into your own hands like we did by setting off on a personal tour in our rental car. The latter option became the preferred course of action because we wanted the flexibility to be able to make stops as we saw fit rather than adhering to a tour schedule. Of course, by opting for that flexibility, we also chose to forego hearing any interesting information a tour guide might have had to share. 2:16 p.m. — The car ahead of us steals the single-vehicle turnout we were eyeing up in Þingvellir National Park, forcing us to move onto the next one. That’s fine with us. Our scenic turnout ends up being better anyway. Your loss, other tourists. 2:17 p.m. — The view of the snow-capped mountains in the distance quickly makes us forget about where we did or did not park. I have to remind myself again that we are only in another country and not on another planet. It would be well into the afternoon with only a couple hours of daylight to spare before we made it to the Geysir area, which sits slightly off the Ring Road, about an hour and a half drive from Reykjavík. While it may have been the third or fourth stop for people who got out of bed at an appropriate hour, it was only our first official stop of the day. So, after watching Strokkur, the most active geyser in the area, erupt about five or six times — had to get that perfect slow-motion video, you know — of course we spent at least a half hour perusing all the T-shirts, shot glasses, coffee mugs and other Icelandic paraphernalia on sale at the nearby Geysir gift shop, dwindling hours of daylight be damned. The place had a cafe too, but rather than sit down and lollygag any further, we came to our senses and hit the road for the next stop, which was surprisingly close by. Gullfoss was easily the largest and most impressive, in my opinion, of the waterfalls we saw in Iceland. Existing in a spot where the Hvítá River cascades down a 105-foot crevice, Gullfoss would probably be quite something in the summertime when the surrounding landscapes are brimming with greenery, but I don’t know that you can beat visiting this waterfall in the winter when the snow and ice cover most everything and you feel like you’ve been plopped down into the middle of a work of art. Descending the ice-covered pathway that leads from a platform up near the parking area down to a viewing area practically in the falls was an adventure in and of itself. Multiple signs advised us to attach our crampons — traction devices that latch onto footwear to improve mobility on snow and ice — but wouldn’t you know, we’d left those back home, in the store, on the shelf. Perhaps if we had planned on doing some ice cave tours or glacier walks (find information on a tour that includes both activities here), we would have shelled out for those crampons. But no such plans existed. 5:33 p.m. — With darkness descending in earnest, we arrive at Kerið, the volcanic crater lake that sits about 9.5 miles northeast of the town of Selfoss. For the first time, we encounter a booth charging an entrance fee to see one of Iceland’s natural attractions. Ryan is less than impressed as we pay 400 kronas (about $3.29) each to see a giant hole in the ground. 7:30 p.m. — After squeezing the rental car into a tiny parking lot adjacent to Grillhúsið, a restaurant on Tryggvagata in downtown Reykjavík, we head inside for food. The host asks if we have a reservation. We don’t, so we ask if we can wait for a table to open up. “No,” he says. It’s so unconventional that Kelsey and I look at each other and burst out laughing. She nearly trips over the door frame on the way out. 7:44 p.m. — Three more rejections follow at other nearby establishments before we finally find a place that will let us sit down: Bazilika, a diner-type joint right down the street from Austur and American Bar from the night before. Another night in Reykjavík, another opportunity for shenanigans to ensue. After we’d had our fill of fish and chips (for Ryan and Israel), cheesed-out pizza (Kelsey) and egg-topped burger (yours truly) at Bazilika, it was time to prepare for round three out on the town. We wound up making appearances at three repeat offenders from the previous nights, including Kíkí, Austur, and Paloma, but also aded two new venues to the roster: Húrra, a spacious bar with live music on the corner of Naustin and Tryggvagata, and Tivoli, a low-key joint sporting a foosball table on Hafnarstraeti. As it was Halloween weekend over in the good ‘ole U.S.A., we were curious to see if people would be out in costumes, and most places we went didn’t disappoint. Nearly everyone we saw at Austur, our first stop of the evening, was dressed up, and though none of us brought costumes over to Iceland, people could have mistaken Kelsey and her long black boots for a pirate. Before the clock struck 4:30 a.m., we’d managed to run into a middle-aged couple from Michigan at Tivoli, get free drinks from a rather large Icelandic girl who had her eye on Kelsey, walk all over the sticky floor at Paloma (which had not been that way the night before), grab overpriced slices of Sbarro pizza at a supermarket and witness a bar fight at Kíkí which ended with one very angry dude attempting to punch out a window (which Kelsey would later cut her pinky finger on). After three straight nights of tomfoolery, Day 4 would offer a much lighter schedule and a much-needed reprieve.